All remaining Libyan diplomats are being expelled. The Libyan Ambassador was expelled in May. The Foreign Office confirmed that the Libyan Charge d’Affaires has been called to the FCO and is being informed that he and the remaining Libyan diplomats in the UK are being expelled. “What we are doing in Libya is necessary, legal and right. We could not and did not turn a blind eye when Qadhafi turned his forces against innocent civilians, shelled peaceful protestors and targeted victims crammed in hospitals. The international community’s actions have saved thousands of lives. We have averted massive slaughter in Benghazi. And we have protected innocent Libyans across the country. When I visited Benghazi I saw for myself how close Qadhafi’s forces came and what was possible after they had been stopped. My visit allowed a window into a Libya free from Qadhafi - where the legitimate aspirations of the people are welcomed not repressed, and where debate, a free media and civil society are encouraged not crushed. 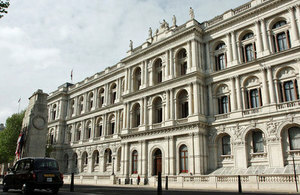 The UK is committed to supporting the Libyan people. We are a strong and true friend. Britain has lead implementation of UNSCR 1973 from the front - providing key aircraft including Typhoons, Tornados and Apaches. We have led political support to the NTC - bringing together an unprecedented international coalition at the London Conference and providing practical assistance since. Our office in Benghazi is now our largest in North Africa after Cairo, and led by one of the Foreign Office’s most senior diplomats. UK teams have helped build command and control capacity as well as assist the NTC in their post-Qadhafi planning. And we have provided communications equipment, support for the emerging free media and widespread support for the police. We have provided substantial humanitarian assistance and support to clear mines. We are already helping communities return to normal life and we are continuing to advise the NTC as they look beyond Qadhafi. The Libyan people can be assured that we will remain on their side for as long as it takes. At the latest Libya Contact Group in Istanbul the international community sent an unequivocal message to Qadhafi: that he had no legitimacy and there was no future for Libya with him in power. As part of this it decided “to deal with the National Transitional Council (NTC) as the legitimate governing authority in Libya”. This was a significant development, and today I will outline the action that the UK will now take in response. The Prime Minister and I have decided that the United Kingdom recognises and will deal with the National Transitional Council as the sole governmental authority in Libya. This decision reflects the NTC’s increasing legitimacy, competence and success in reaching out to Libyans across the country. Through its actions the NTC has shown its commitment to a more open and democratic Libya - something that it is working to achieve through an inclusive political process. This is in stark contrast to Qadhafi, whose brutality against the Libyan people has stripped him of all legitimacy. The NTC is a focal point for people throughout Libya who want a better future for their country. Our decision also reflects the responsibilities that the NTC has taken on in the areas under its control. It means we will deal with the NTC on the same basis as other governments around the world.. In line with this decision we therefore summoned the Libyan Charge d’Affaires here to the FCO this morning and informed him that he and other regime diplomats from the Qadhafi regime must leave the UK. We no longer recognise them as the representatives of the Libyan Government, and are inviting the NTC to appoint a new Libyan diplomatic envoy to take over the Libyan Embassy in London. In line with UNSCRs 1970 & 1973, the UK continues to explore how to unfreeze assets to support the NTC. At the request of the Arabian Gulf Oil Company, a Libyan oil company, the UK is ready to make available £91 million of the Company’s assets in the UK. AGOCO is operating under the control of the NTC and we are assured that its activities will not benefit any listed entity under the sanctions. We will issue licences for the use of its frozen funds to meet its basic needs. This will help to ensure that the crucial provision of fuel is maintained. We will work hard with our international partners in the coming weeks to unfreeze further Libyan assets frozen in the UK for the benefit of the Libyan people, including stocks of Libyan currency and other assets of the Libyan Central Bank, in line with UNSCRs 1970 and 1973. We are also discussing with partners what funds we can make available for the benefit of the Libyan people to alleviate the hardships they face. I am conscious that the Libyan students in the UK whose expenses have been paid by the Libyan People’s Bureau will be concerned about what this decision means for them. I want to reassure them that we are working closely with the NTC and the relevant banks and will do all we can to make sure that they and their families will continue to receive the funds to which they are entitled. This decision marks another step towards a better, democratic future for Libya - a future that does not include Qadhafi. The momentum has shifted against him and those around him. There is steady progress across the board, in particular around Misrata, Brega and Jebel Nafusa where the opposition is driving Qadhafi’s forces back. Reports suggest that morale amongst the regime’s forces is low. Economic sanctions are restricting his ability to wage war on Qadhafi’s own people. I am making this announcement today to reflect the facts on the ground and increase our support for those fighting and working for a better future in Libya. We will sustain our actions for as long as is necessary. Our recent decision to deploy an additional four Tornados to Libya is a concrete illustration of this. This was the united international message from the Contact Group in Istanbul.